Discussion in 'Guitars in General' started by jondkang, Feb 17, 2012. Hey guys. Here's a Strat that I recently bought for X amount of dollars. Can y'all help me identify what this might be? I just have no clue... Here are some pictures. The headstock wording makes me think it is a MIJ neck. It could have been a partscaster. You should remove the neck and look at the numbers underneath. Look closely at the inside cavity of the body. You might find some clues there. FWIW, I had one just like it. Nice strat. The parts are just so interchangable that it might be very difficult to nail down. Try running the serial # as well on the Fender.com website. Ahh, I see. It was advertised to me as a MIM but I knew it wasn't that. I've never 'opened' up any of my guitars, so we'll see what happens there. I just wanted to see if anyone recognized something at first glance. Maybe I'm better off not knowing! Thanks! Anyone else have any ideas? 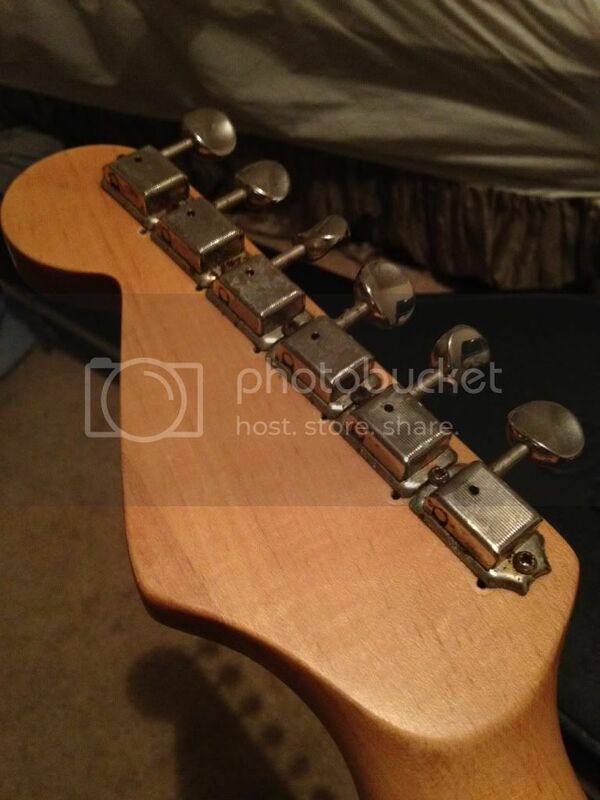 Thats not a Fender neck - the string trees are in the wrong positions and its a laminate. The tuners have obviously been replaced, and the shape of the headstock is too rounded, the bottom of the neck is also different. It's not an MIJ 'cos I have one. As for the rest, yes it is a case of taking it to pieces I'm afraid. 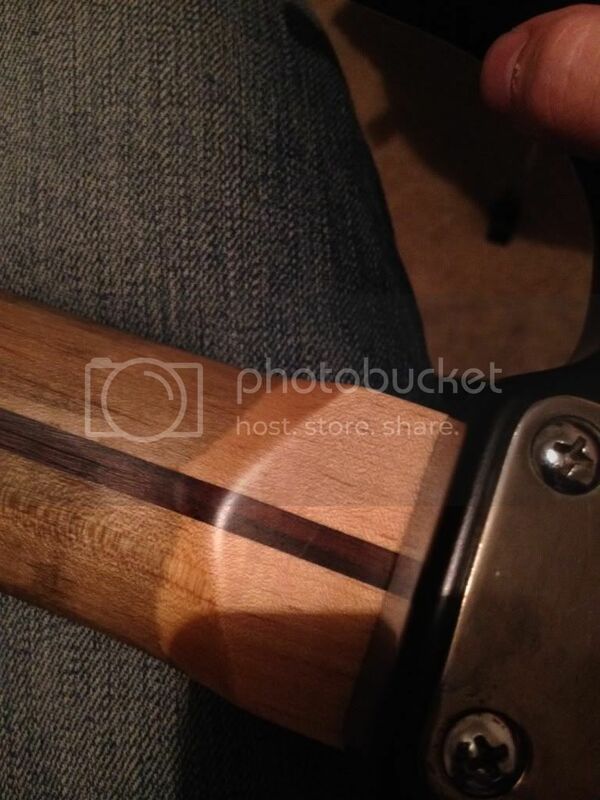 No Serial number on headstock is always bad for newer MIJ's too. I found very helpful information in this article when I was looking to buy my Strat. It really helped me stear clear of the misinformed sellers. You really have to take off the neck and look under the pickguard, too. 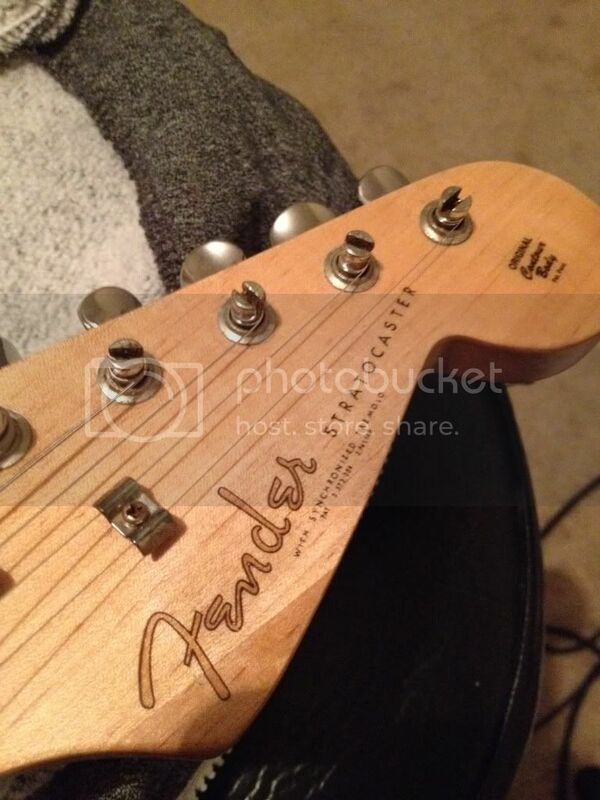 I also don't think that's a bona fide Fender neck. Anyone can slap on a decal. The tuners have obviously been changed (by an amateur, they don't even line up) and that mis-matched dark piece of wood on the corner of the headstock is a red flag. Hard to tell from the pix but it looks like a glued on piece where the grain isn't even running the same direction as the rest of the neck. But if it sounds good and can be setup to play well then don't worry about it too much. I just hope the "X" in "recently bought for X amount of dollars" was not too high. Looked like a roadworn, at least half of it, to me. The body has the typical wear pattern and arm wear they do. But the neck is NOT. 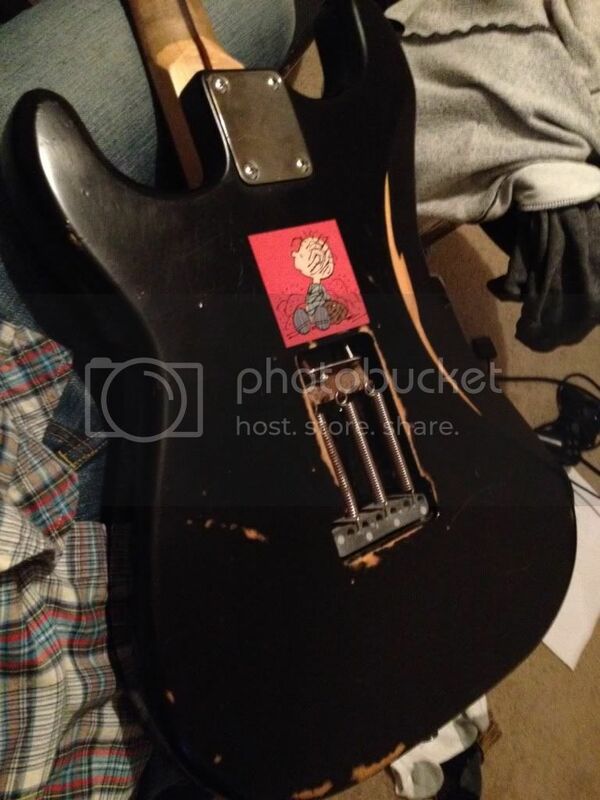 It looks fudged with, tuner holes, headstock shape looks a bit off, Has two piece headstock, two trees.... I think they put a cheap neck on it and called it a MIM because of the body. Probably sold the neck for more profit. If it plays well, who cares. It looks cool and you're only out a few hundred dollars. Definitely this. Just wanted to see if I had struck gold or not. Haha. Thanks for all the help, guys. Also, apparently, the wear was done by someone 'professionally'. He said the guitar did not come that way. Seller also claimed that most of the 'work' was done by the previous owner. He only put new Tex-Mex pups in. Def looks like a road worn body and certainly not a RW neck. I've never 'opened' up any of my guitars, so we'll see what happens there. I can understand that, I just thought it was funny because I'm exactly the opposite, I would bet every single guitar I've bought in the past 25 years got shredded the minute it hit my front door. Every piece, every screw, cleaned up, spiffed up, polished, waxed, oiled, modded (if needed) before I ever put new strings on it and actually played it. Just like you might look at that and think, 'It's perfect!, I love it! ', I look at that and think 'Wow, a full weekend of fun gutting it and rebuilding it nice and shiny and pret-ty again. 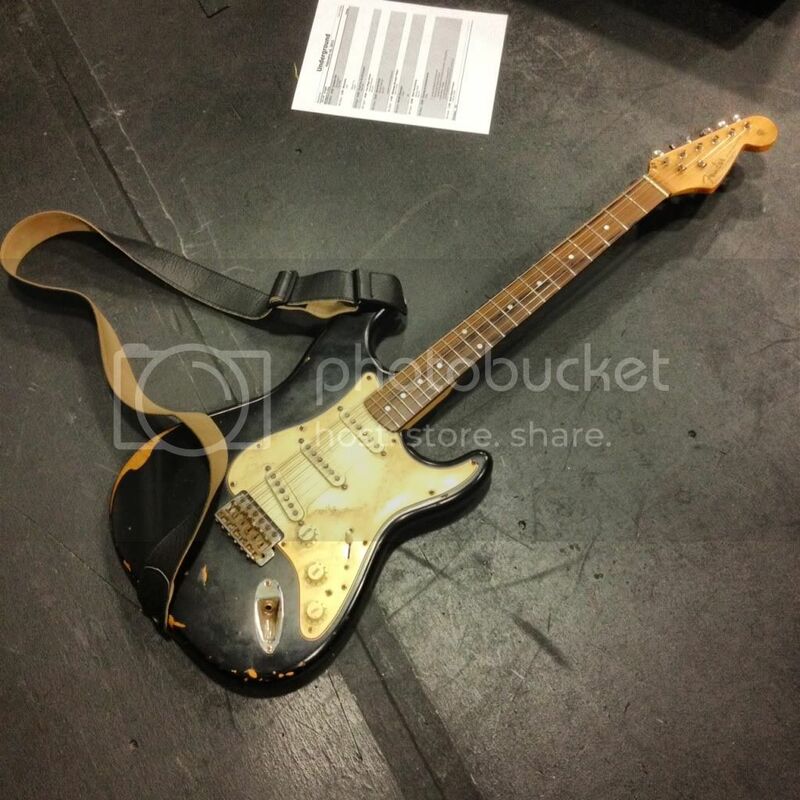 For a relic'ed guitar, (which is not my thing), it looks pretty nice!.